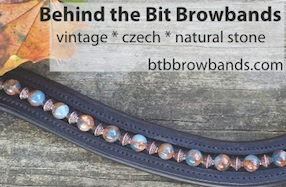 Behind the Bit: That's quite a neck! I know very little about Saddlebreds and gaited horses. Look at at this young Saddlebred's long, curved neck! I don't know if this is good or bad, but it's quite dramatic -- almost cartoonlike. think I'd like to see the horse in person, maybe moving freely. In each shot the horse is holding his head rather upright, so it is hard to judge its shape other than to say it is impressive. Of course I love the color. I used to dream about horses with this coloring. Had a Saddlebred to ride for a while and absolutely loved him. This one is a stunner. What fun it would be to take him and train him from the first as a dressage horse. You could develop the muscles in his back, teach him to stretch and in a few years...wow!! It's so strange looking. Sort of looks like a dinosaur or what I would imagine the lochness monster to look like. That being said, I love it and think it looks elegant and pretty. I have eccentric taste though. What is that color called (gray with black mane and tail)? Wow, impressive coloring! The colt's high head carriage looks due to hormones. Notice how he's running down the lady in the first picture -naughty boy. The neck little too swan like for my taste, but the colour is WOW. Love that colour, it's amazing but what the heck!? I can't see that neck's angle being beneficial to the horse conformationally sound later in life wise. LOL.. Saddlebreds have been some of the more.. "interesting" horses we've met in our practice to say the least. Dear Husband was walking by as this came up on screen, and he said- "Holy cow- who bred the llama to the horse?" hahaha - great llama analogy. I'd like to see what this colt looks like when he is more mature. Ummm... he is a bit odd to me also, but one of those horses I can't stop looking at either. There was an Arabian at the barn I boarded one time she had a really long neck. Not quite as long as this guy though. When you would walk by her stall she would give you the ugly flat eared look. With The flat ears and long curved neck I nicknamed her "snakeface." She was a sweet horse, but don't walk by her stall! When you breed for one particular trait (like paint color, or a swan neck), you end up accidentally bringing along many less attractive traits in the process. I highly recommend Temple Grandin's books--she explains this very thoroughly. I've never seen a neck quite that long before. I'm guessing he's going to grow into it. He sure does attract attention, though. My initial response was oh-god-oh-god-oh-god! Yes they want their heads up high, all for show, not for function. I suspect eventually when he is older, his poor back will drop terribly like so many saddlebreds do. To me this poor guy is an example of what humans do to animals because of their egos, not for the benefit of the animal. My first impression "What a Freakshow" The whole animal looks wrongly assembled from unrelated parts. I hate necks that are muscled from below. Maybe totally different in person. The llama movement must stop now! It's spreading from breed to breed! Honestly the neck is fascinating and sort of hypnotic - the color is like a Breyer model - but the head is a tad bit like a brick on top of all that swan-like grace. . . I suppose they'll tackle that next. However, in defense of the breed (and no, I'm not even into Saddlebreds), we also have a very lovely-looking and -moving one at the barn where I work. That'a definitely a grey. His black mane, tail, and legs will lighten up with age. I don't know about that neck though- striking but so odd. Personally, I think it's freaky. I like the 'llama cross' resemblence. lol. I think he's gorgeous! Like the greyhound of the horse world. The coloring makes me miss my TB. He was registered as a gray (if that helps anyone on the color id front) but never lost the jet black mane and tail, and four long black stockings as he matured. I bought him as a 5 yo and he lived to 23. No color change. Originally, saddlebreds were designed on a plan that would allow them to excel in dressage or jumping sports. There are still plenty of these ASBs available. However, the breed has become so insular, with little effort made to provide outside outlets for the horses, and all focus put on saddle seat. As a result, a "modern" style of saddlebred has developed with the most noteable characteristics being a very kicked back shoulder, lordosis, sickle hocks, and long backs. Even still, much of the "saddlebred look" that people recognize is trained into the horse in the process of saddle seat training. The focus on false collection, riding the horse from front to back, and using training methods that exaggerate their upward neck carraige and high knee and hock action. For a look at what traditionally bred saddlebreds look like, I'd encourage you to check out www.pariahpony.wordpress.com - there fewer and fewer strictly traditional ASBs out there, as they aren't appreciated by the saddle seat world and the sport world sees them as "just saddlebreds". They are in existence though, as are more cross over types which have a chunk of old lines to draw from. As far as the horse pictured is concerned.. I have no idea what his bloodlines are, but he does look familiar to me (I wonder if I've seen him before..hmm). Saddlebreds can most definitely succeed in dressage... if just given the chance. Please reference Harry Callahan and Forty Something for a glimpse at what they can achieve when given the chance. Thanks for such an interesting blog! That's a giraffe in a horses body. I have to say awful neck but great color. My first thought was "Wow, beautiful color." My second thought was, "He should be gelded." He looks stylized: which would be OK if it was a a painting, but he sure looks overbred. Saddlebreds, Tennessee Walkers etc were bred for stamina and long hours in the saddle, this colt doesn't look like he could do that. "If I was an artist like you, I would draw a true picture of Traveller; representing his fine proportions, muscular figure, deep chest, short back, strong haunches, flat legs, small head, broad forehead, delicate ears, quick eye, small feet, and black mane and tail. Such a picture would inspire a poet, whose genius could then depict his worth, and describe his endurance of toil, hunger, thirst, heat and cold; and the dangers and suffering through which he has passed. He could dilate upon his sagacity and affection, and his invariable response to every wish of his rider. He might even imagine his thoughts through the long night-marches and days of the battle through which he has passed. But I am no artist Markie, and can therefore only say he is a Confederate gray." Does this colt fit that desription? the colts colouring is a buttermilk buckskin. I am in absoloute love with this boy, his name is "Pantheon"